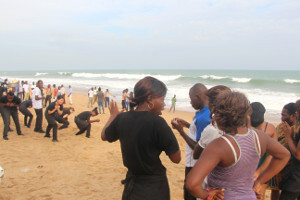 Two stories of how God is using the DRIME Togo teams to share the love of Christ on street corners and beaches. After telling her to just believe and explaining more about the Gospel to her, Christine made the good decision. Three other youth joined her in this decision on that very street corner. 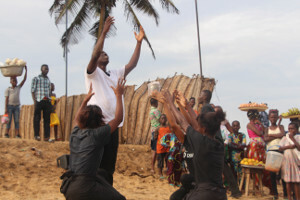 During one of our drama performances, there was a young boy named Kossi who was alone and was watching from a distance. He watched all of the dramas from beginning to end. When a DRIME member approached him and asked him what captivated his attention, he just said that it is the man in white. He was interested in this man because he was delivering people. He added that he was Christian but has stopped going to church 2 years ago because of the way he was living. Instead of making Kossi feel bad about not going to church, or making him feel guilty, the team has just prayed and encouraged him. They explained to him more about Jesus and who he is really, and how the man in white could deliver him too.